Researchers at the University of Twente have developed a new superconducting cable system that is crucial to the success of nuclear fusion reactors. The superconductivity research group of the University of Twente (UT) has made a technological breakthrough crucial to the success of nuclear fusion reactors, allowing for clean, inexhaustible energy generation based on the workings of the stars in our galaxy. The crux of the new development is a highly ingenious and robust superconducting cable system. This makes for a remarkably strong magnetic field that controls the very hot, energy-generating plasma in the reactor core, laying the foundation for nuclear fusion. The new cables are far less susceptible to heating due to a clever way of interweaving, which allows for a significant increase in the possibilities to control the plasma. 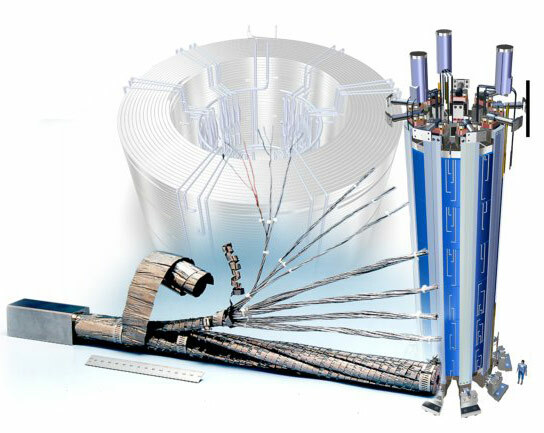 Moreover, in combination with an earlier UT invention, the cables are able to withstand the immense forces inside the reactor for a very long time. The increased working life of the superconductors and the improved control of the plasma will soon make nuclear fusion energy more reliable: the magnet coils take up one third of the costs of a nuclear fusion power station. The longer their working life, the cheaper the energy will be. The research is a project within the context of the Green Energy Initiative of the University of Twente. Cost-effective clean energy Project leader Arend Nijhuis: ‘The worldwide development of nuclear fusion reactors is picking up steam, and this breakthrough leads to a new impulse. Our new cables have already been extensively tested in two institutes.’ Mr Nijhuis has been invited for a new collaboration with China and expects that the UT system will become a global standard. 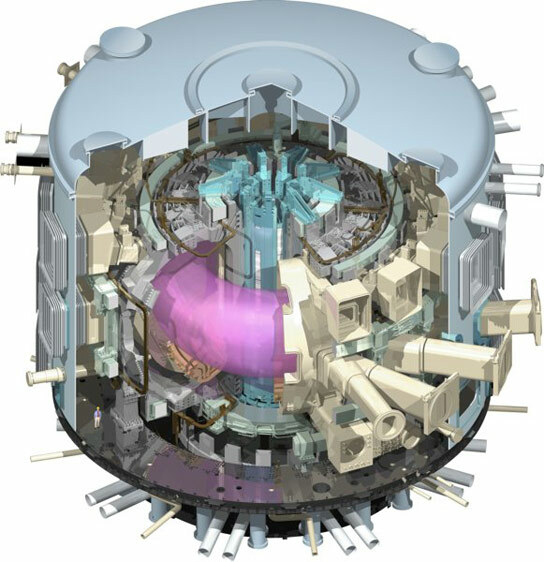 The world’s largest nuclear fusion reactor, ITER, is under construction in Cadarache in France, and is expected to start operation by 2020, as a joint project of the US, EU, Russia, India, Japan, South Korea and China. However, China and South Korea have also initiated their own national large-scale nuclear fusion projects, in which the UT technology can be incorporated. How does it work? Nuclear fusion takes place in the heart of the reactor, in plasma with a temperature of 150 million degrees Celsius. An enormously strong magnetic field (of 13 teslas) is required in order to control this incredibly hot plasma. This magnetic field can only be generated efficiently through superconductivity. That is why liquid helium flows through the hollow cables of the coils. This reduces the temperature to approximately 4.5 K (-269 °C), which allows for zero resistance inside the cables and the amperage to increase up to 45,000 amperes, the generated magnetic field controlling the plasma. This immense amperage will, however, also put so much pressure on the wires that it is necessary to prevent a quick wear of these wires. 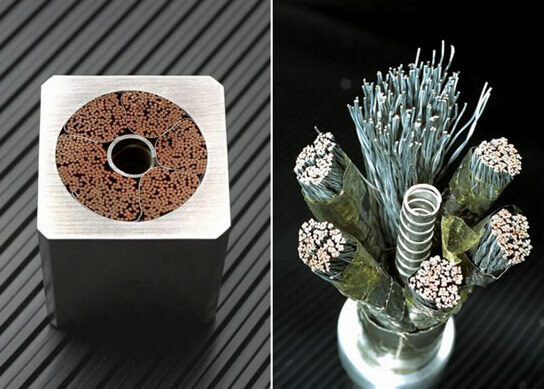 Moreover, rapid changes of magnetic field can create excessive temperatures inside the cables, causing the superconductivity to break down and the fusion process to extinguish. It is exactly this problem which has now been solved by interweaving the superconducting wires of the coil in a special way. Clever way of weaving The wrist-thick cables around (six) coils with a total height of 13 meters inside the fusion reactor consist of interwoven wires with a thickness of 0.8 mm. The first step is to bundle three of these thin wires: two wires made of superconducting niobium-tin and one wire made of copper. This copper makes the whole resistant to heating during any undesired sudden end of the superconducting state. Three of those first-level wires are twisted around each other. After that, the weaving process continues until the desired thickness has been reached. The length across which the wire spirals once – the pitch – and the mutual proportions between the successive weave levels appear to be crucial. An increased pitch of the first weave levels ensures that the cables resist the immense mechanical forces better and prevents any strong distortions. However, the breakthrough which gathered most international surprise, even though already predicted at the UT, is that the new ‘pitch proportions’ result in such a strong reduction in the currents between the wires that there is much less heating of the cables and the cables therefore continue to be superconducting. So the new cables have considerably increased the chance that nuclear fusion energy stations will soon generate power in a reliable way. Be the first to comment on "New Superconducting Cable System Brings Nuclear Fusion Power Station Closer to Reality"